You are here: Home > (Updated )Costco Places The Samsung Galaxy Note On Closeout, What Gives? (Updated )Costco Places The Samsung Galaxy Note On Closeout, What Gives? 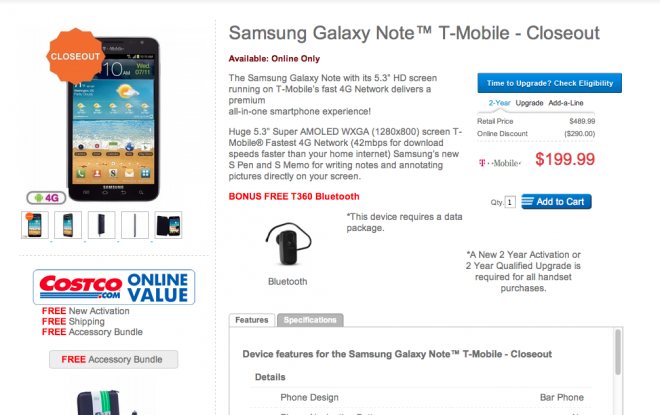 So, what gives T-Mobile, where has the Galaxy Note gone? I’ve pinged T-Mobile with the hopes of someone getting to the bottom of this. The real question now is — is this indicative of T-Mobile moving on the next model in the Galaxy Note series? We honestly can’t say, but we are a little curious about why a device would disappear just after launch? I have decided to get the Note in lieu of an SGS III. So I guess now the issue is do I get the “old Note” or the new one coming out. Where has T-Mobile’s Note gone? Maybe the jury came back on the Apple v. Samsung case here in San Francisco and the Judge ordered Samsung to stop the sale of all devices that look like an iPad or iPhone. LOL… I know that’s not it. LMAO we try to tell these people that a last year’s Note on T-Mobile was a stupid idea! Walmart doesn’t have it either!! Same “The offer you selected is no longer available.” message. I am pretty sure that Wirefly, Costco and Walmart, all use the same back end set up for their online cell phone sales. I sued Tmobile because of that phone…and I won. You should follow my lead. That was literally the worst investment I have EVER made. Once I did the Android update it improved a hundredfold. Been locking up recently, but I run a ton of apps. Been thinking of rooting it and going with Cyanogenmod like I did with my original G1. Samsung is a great company, the Exhibit might just be a defective phone. That’s that crap company LG’s fault. Not entirely. LG made the phone…but TMOBILE KNOWINGLY sold a malfunctioning unit that they were not prepared to deal with the consequences of…at least, that’s what I “proved” in court that gave me my win. You sued T-Mobile? Come on, they’re struggling while LG doesn’t even deserve to be in business. I got the G-Slate and the douches locked it via an already out of date Android update, effectively screwing over developers and in the end, a lot of devs just sold theirs because it wasn’t worth it. I wish Tmobile comes out straight and gives us an answer. I hope they are getting the Galaxy Note 2. Cause I want it. Eww that disgusting home button on the S3! Eww! I was interested in the T Mobile Note. Seemed like the best platform to take advantage of the $30, 100, minute, unlimited text and 10 GB data plan. I’m no longer sure about switching to T Mobile. They seem to be a bit goofy headed. The price for the Note was too high to start. Then there were none available at my local T Mobile stores at launch or since. The store employees were given no information about availability, I knew more about the phone than they did. Now they pull this crap. I”ve found a few T Mobile G Notes on Craigslist in the $500 range. I would have preferred to buy new at the store but options are becoming limited. For all I know this things going to become a sought after collectible. Strange way to run things if you ask me. Would it still be able to take advantage of the HSPA+ 42? I was under the impression there was a problem doing that, or is that just with the unlocked international version? The hack works but it is far from stable. Network access latency is all over the place and data speeds are not consistent. Unless you can find the Att version super cheap I strongly advise against it. It also seemed goofy and contradictory to the value message theyre trying to sell to put the GS3 at 279 while everyone else including third party Tmobile retailers are selling at 199 (except wirefly and those stores only offer limited contract options and not all the variety that Tmobile;s website does)…Seems you need to sign up for the higher priced plans…like they told me they will not sell me thephone on a 200mb plan. I’m an anomaly, then. I work for T-Mo, knew about the G-Note since the original leak in March, and I own one. I got it the day after launch. Ordered it the day before, on launch by calling customer care and putting an EIP on it for my Value Plan. Next-Day Shipping was $25. $262 after taxes. I freaking love this phone! It’s funny, whenever customers look at the GSIII and dismiss it as being too big, I pull my Note out and freak them out. They feel pretty stupid for bashing the GSIII once they see my beast of a phone! I think I’m gonna start telling customers who ask about it that it’s an internal exclusive, and is only available to T-Mobile Employees, that’ll get them to buy GSIII’s, lol. If theyll soon be selling the GalaxyNote 2, I bet there will be some very angry customers. I think you have misunderstood what T-Mobile is doing. They are adding additional coverage in the 1900 bands that att uses for 3G and repurposing some 2G towers to provide additional coverage in the 1900 band. What you are missing is they will have far fewer 1900 towers then att and therefore T-Mobile will not have nearly the 1900 coverage. I was wondering what they were doing with 2G. So 2G will still be on the 1900MHz band? That is a big issue that many people have with Tmo. Outside things may be good with signal but go inside and you got nothing. This is where they push wifi calling to compensate for the signal loss when I’ve called cs about it. If you have wifi for wifi calling then you don’t need cellular data either because you have wifi. My experince is the data will totally drop off and the phone will show no signal bars but I can send txt msg’s and get calls when inside buildings. Trying to load the web or anything else is complete hit or miss. They say their upgrades will improve quality and signal but they also say my phone could get 42mbs download speeds on the network. Nice on paper but reality and actual use is different. Only time will tell how the upgrades will actually work. I don’t think my experience will help you, as I was on the west side of Atlanta during a recent visit. My coverage was fine in the Cascade area; my mother lives very close to two T-Mobile towers so great coverage was to be expected. I could talk on that phone inside of her house better than I could on my AT&T phone. I also visited the Marietta area, but can’t really comment on how great the coverage was there because I wasn’t staring at my phone while indoors to notice the signal quality. I used the phone while driving near I-75 and Dobbins AFB and had no problems making calls. GPS was fine navigating from somewhere on I-85 north of Gwinnett County over to the Marietta location. GPS service didn’t drop for me at all, but as you can see, I stayed pretty close to and on the interstate. Hopefully it means the Note 2 is coming. I would be interested In that, sure would be nice if the screen size would increase as speculated, but keep the same phone dimensions. Maybe thinner if possible. there were many issues with the launch of the Note and being that the phone has been out for quite some time with AT&T the company didn’t have a choice but to remove it off of the sales floor. It was only released to limited stores around the U.S. in hope of positive feedback which wasn’t the case. I ordered the Note on Walmarts website last night and got the conformation that it is being shipped to me and I will have it tomorrow. I called customer service and asked about the note and they said it was just sold out and was removed from the tmo website due to it being sold out, and we have seen tmo do that when something is sold out. I really dont see tmo getting the note 2 at launch. I agree with you in spite of a lot of people holding out to get the Note 2. I don’t think TMO will get it until next year so people who want the original Note, shouldn’t regret getting it. I guess we’ll know for sure in two more days. I spoke to Wireless Costco representative and he said that T-Mobile will replace Note with Note 2. I am excited for Note 2 to come out. That’s good to know Joni…so did you get it yet, or is it still on it’s way? I was in T-Mobile about to get the note and about 4 people were returning it for the s3 why are they returning it one of them said that I wasted my upgrade for the same phone which has a larger screen and now was thinking about getting one until I got info about the specs it just like my T-Mobile galaxy s2 with just a bigger screen what was making me get it was its huge screen but I want to upgrade to better phone not the same thing with a bigger screen so I will pass the note and get the galaxy s3 that seems more of an upgrade and didn’t att get this phone like 7 months ago ??????? He’s trying to say he doesn’t understand punctuation. If you look back and read, you’ll see that “griffin”, “mandy”, “grim” and “Robotate” are more than likely all the same poster. The writing style of each one is EXACTLY the same (including the multiple ??????? at the end of the rant). LOL, that has to be it! i caught that too! trolls! i was in my chair and i was thinking if anyone had an update about the t-mobile samsung galaxy note not being for sale anymore so i typed on my computer to the browser and i went to the website with the information to the article about the samsung galaxy note not being for sale anymore and i was like are there are new updates so i just went to the bottom of the website and i saw that no one had any updates just some comments about the samsung galaxy note not being for sale anymore and read yours i died ???????? Your a nasty pos just like this horrible company (T-Mobile) you and this company can both do this world a favor and jump off a bridge. Who cares if you don’t ever use punctuation except at the end of your rant? r u answering your own posts with different names? Wow you must not have a life to indicate stuff like that tell me something smart and impress me so I can tell if you have a life or not.because apparently you don’t. I was the one who told you guys about this. Where is my credit? I am sure they bought the Note at a discounted price and since the phone is discontinued I bet it was a ONE time BUY!!! Tmobile relies on idiots like some people here to buy a year old phone at such a high price. Stop complaining and either wait for Note 2 or go somewhere else. If it’s true that the Note is EOL then that’s pretty sad and pathetic on Tmo’s part. Why didn’t they just wait for the Note II in the first place? Perhaps it’s just a problem with the inventory. i just got off the phone with t-mobile customer service the samsung galaxy note willbe back in stock on the 31st of august. Thank you, hope this is true…a little more positive news is that it is now back in the TMO website as “Out Of Stock”. hope tmo galaxy note reappear with low price without issue. i’m pretty sure both the S3 and the note will eventually get jelly bean. I just called Tmobile to buy a Note and the lady put me on hold several times to come back after five minutes saying that her supervisor told her they are getting the Note2. It is hard to believe since I don’t think it will arrive in tmo this year but who knows. Im done waiting for Galaxy Note 2 .I am going old school brining back my HTC Touch 2 dual boot running android Jelly bean and Windows 8 with stylus mini pen. I don’t need a Note. I just loaded Ice Cream Sandwich on my HP Touchpad….the one I paid $99- for. Pretty darn cool too. Okay I think I may have figured this out. Apparently when the next iPhone will launch, it will face shortages. Maybe Samsung is going through some shortage issues and T-Mobile removed the phone from its site hoping nobody notices that they’re out of stock then when it’s back, they say they were having issues with the site. Just a thought, probably not right though. Also, I just wanted to say: I have the galaxy note for T-Mobile. I LOVE it. I like touchwiz 4 more than stock, the s pen is super useful, I love the vast amount of screen real estate, the HSPA+ 42 is great here in NYC (the other day I took a speed test and got a speed of 20.35 down and 3.32 up), and the only time I ever experience lag is when I have a bunch of apps open and I long press the home button into multitasking. The Galaxy Note T879 is an extremely capable device and I am glad I bought it instead of waiting for the note 2. 1. Suppose, just suppose, that Samsung had allocated a certain (small) number of original Notes to T-Mobile. They were already manufacturing the new Note 2s, so T-Mobile could use these to get an idea of the demand for the Note, while Samsung could get rid of some unwanted inventory. Win-win situation. 2. Say both Samsung and T-Mobile underestimated the demand for the original Note 1 among T-Mobile customers — which is apparent from the immediate “out of stock” situation at several retailers, and also explains why some corporate and other stores didn’t even get any Note 1s. 3. So, now Samsung is faced with possibly having to manufacture additional first-generation Notes for T-Mobile to meet that demand — BUT Samsung has already committed to their launch of the Note 2 next week. And no other vendors (eg. AT&T) want any more Note 1s. 4. Not wanting to make more first-generation Notes, Samsung refused to make more for T-Mobile. To cover its rear (and to not start speculation about getting or not getting the Note 2), T-Mobile decides to simply remove the Note from its website, so no more could be ordered. 5. Now that they have a good idea of the demand for the Note series, T-Mobile will sell the Note 2 rather than more Note 1s. I. It explains why Costco is listing the Note 1 as a “closeout” — they’re not getting anymore Note 1s, they’ll be getting Note 2s. II. It also explains why the T-Mobile supervisor in the posting below (SDJB) said that T-Mobile would now be getting the Note 2 going forward — and maybe / probably no more Note 1s. III. And it explains why in a posting below ( Somegayusername ) a person was told that “the samsung galaxy note will be back in stock on the 31st of august. ” It probably will be — it’ll just be the Note 2 rather than the Note 1. Either that, or Samsung will resume making Note 1s for T-Mobile after they meet the initial demand / manufacturing run for Note 2s, say, for AT&T. I may be wrong, but with the iPhone5 release looming, Carriers that don’t plan to sell the iPhone5 should be wary of allowing other high demand mobile slip through their fingers. Making every customer happy with OTHER current favorite mobiles should be a in-stock priority in-store for Corp and Reseller stores. Maybe TmoUSA new marketing CEO and team a different ploy to grab customers. Small quantity of Note 1 on Tmo was a teaser….the real deal is coming Note 2. It is pointless for Tmo to be selling the Note1. I really hope your right! That update still doesn’t tell us much. It is really starting to feel like the Note 2 will take a much faster pace to release and is going to replace this. If true, that really makes T-Mobile look bad for how they managed the release of the original note. If they knew the note 2 was coming to them quickly after announcement, why did they pursue this at all. T-Mobile is starting to look like a poorly managed company in many respects. No, the majority of what I said are “its” the last comment is based on the recent record of poor JD power surveys, employee complaints, and poor earnings reports. Here’s my crazy assumption…….theyre out of stock. well was there really a high demand for the Note anyway on TMO? most people were simply waiting on the Note 2 announcement anyway … so i’d be curious to know how the Note even sold so far. The updated statement doesn’t actually speak to specifics. Leaves a lot open. A lot of people bash others on this site who complain about t mobile. Then t mobile goes out there and does something silly like this. This was obviously a mistake on their part. They have done some crazy things. They kill their unlimited plan and lower the throttle limit from 10GB to 5GB for whoever had them. It can’t be more than a year later that they are bringing them back…makes no sense. So are they gonna automatically raise the throttle limit or lift it completely for whoever has the 5GB unlimited plans? probably not. If you call and ask to switch to an uncapped plan, they will make you sign a 2yr contract and that’s if they even do it for you. smh @ t mobile. T-Mobile calls it “out of stock” but Costco calls it “close out” and Walmart calls it “no longer available Somebody is being misleading. Some customers want a T-mobile Galaxy Note .First of all although Galaxy Note 2 will be announced on Aug 29 it could be several months before any American carrier offers it, not everyone is interested in the greatest and latest some customers are happy with a phone that meets thier needs .Who here has not bought a last year model TV or DvD player or Mp3 player or car or for that matter a product that is not the greatest and latest .There is no master plan behind the simple fact that this was a limited release and it has sold out .There is always something with better specs in the future if you keep buying phones to always have the latest model you will upgrade every three months .Long live the T-mobile Samsung Galaxy Note !! I agree with what you’re saying but they were charging this year’s prices for last year’s model. That’s not cool. Thanks Justinbieber lol! I’ve been saying that for weeks now! The Galaxy Note would be an upgrade for many, many customers that probably don’t want to pay the higher price that will be attached to the Note 2. Not everyone wants the biggest and best at all times. Extremely interesting (and disturbing!) is the simple fact that, with a device that apparently sold enough that it almost immediately went to “out of stock” status, no mention was made in T-Mobile’s announcement of WHEN (or if!!!) it would be available again, nor is any mention made of any current backorder situation — those who ordered but have not yet received theirs are also left in the dark, most likely to be dealt with on a case-by-case basis. This is amazing and appalling. And, before the intrepid (and reactionary) amongst you jump me and call me a “troll” or somesuch, know I am a loyal T-Mobile customer (one the first customers of Powertel when it started in Columbus, GA, and then of Voicestream prior to its acquisition by T-Mobile). Allegedly isn’t confirmation. That’s not to say it hasn’t happened though. T-Mobile’s retention department must have known it was on the way out shortly after its release. I’ve had my Note for a little over a week and really enjoy it. I knew it was coming to T-Mobile and wanted it for its large screen, but didn’t want to pay the high price for a soon to be outdated phone. Shortly after its release on T-Mobile, Wire fly offered it for $179. Being a long time customer I called retentions to see if they would match Wire flys price. The rep said they could do much better and offered me the Note for $50. That’s right. No rebate game, No upgrade fee, No shipping charges. $50 plus sales tax ($3.50) and renew my contract for 2 years. (no issues there) Gave my credit card info and 3 days later the phone arrived. Couldn’t be happier. It’s well worth the $53.50 I paid for it.